Sunny & Bright Condo in Town -- Easy Walk Everywhere! Newly remodeled, spotless condo at base of ski mountain in the historic town of Telluride. No need to drive; just use private, covered parking and walk to festivals, concerts, grocery stores, restaurants, museums, shopping. 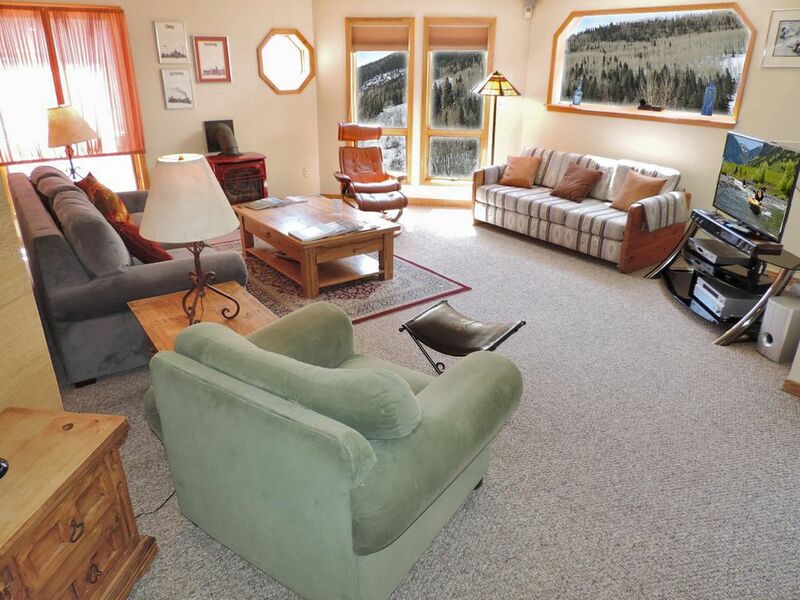 Gondola and lifts are close by for mountain bike rides, hiking, skiing. Quiet, nice views. Bright with lots of windows. San Miguel River flows nearby -- try the early morning fly fishing! Excellent hiking right from your door and full service fitness facility about one minute away! One private BR but sleep up to 5 with 2 sleeper couches and fold out single futon. Great for kids and extended family. Large, tiled shower for two with wonderful steam bath. Outdoor hot tub for stargazing or full moon nights. Comfortable bath with very large all tile glass door shower. Dual shower heads. Relaxation benches and wonderful steam shower! Quiet, less expensive 'in the town of Telluride' lodging. Walk or ski across street to lift and river walking path to all parts of town and valley. Great for walking, hiking and biking. Great location - quiet, across from stream and bus stop, close to groceries and restaurants! Wonderful location, across from stream, bus stop, close to gondola, groceries, restaurants and a short walk to center of town. We just returned yesterday from spending a week at the Graysill condo and loved every minute of it. The owner was very helpful and responsive on our initial inquiry and answered all of our questions in a timely manner. The condo is in a perfect location on the quiet side of town but easily accessible to all activities being across the street from the town walking path, the Galloping Goose stop, and easy walk to the Gondola Station. The condo was clean and well equipped with all supplies. I cooked most evenings, but we did enjoy eating at the Siam restaurant within an easy walk from the condo. The covered parking is a major amenity and we never had to drive our car the whole week. We hope to return next summer. Great condo in a great location! I've stayed here several times and highly recommend it. It's a short walk to the lift and a short walk to downtown restaurants, shops and bars. No car is needed. If you dont feel like walking, the bus stop is right across the street.The unit is welll layed out with a fully stocked kitchen and modern appliances. The balcony overlooks the mountain, a stream and a walking path. What's not to like! The best spot in all of Telluride! I can't say enough about our stay at this fantastic property in Telluride. It is convenient to everything and the furnishings are as comfortable as can be. In fact, I love the pull-out couches even more than the bed with the firm Tempurpedic-like foam mattress. It has a beautiful breakfast/dining area and doors that open to a breathtaking view of the mountain slope. What a perfect place to sit and enjoy any time of the day. You are also only steps away from the chair lift and the gondola up to Mountain Village. Parking is close and convenient as well. Restaurants are only steps away but the kichen is nicely furnished as well. A real winner!!! Sometimes when you book lodging you never know what you're gonna get, what it will be like when you actually show up. We were delighted to find this condo was exactly what we were hoping for. Private, cozy, and romantic when we wanted it yet close to everything when were ready to explore the town and the slopes. The condo was charmingly decorated and WOW the steam shower was a work of art and a perfect ending to a cold day of skiing. We liked it so much that we booked it again for a get together with Colorado friends. The 5 of us fit comfortably with room to spare. We'll be back! Thanks Chas and Jennifer for making it such a great experience! I stayed at this condo with my family. It was the most relaxing and enjoyable weekend that we've had in a long time. The condo is spacious, clean and comfortable. We were in walking distance to good restaurants, shopping and most important, the ski lift where we conveniently took our bikes up the mountain to ride around the villiage and trails. There is a lot to do outdoors in Telluride, but even when it rained one day, we found ourselves leisurely lounging around the condo cooking, playing games and watching movies. We felt at home. The owner was very gracious and attentive, making sure that everything was to our satisfaction. I would recommend this place to a friend or relative without reservation. great at this condo; take bar stools to outside deck for apre ski or summer evenings....see skiers complete their final runs or just people watch. Views up valley are to the highest peaks in the region. Stargaze from the deck at night. L/R Gas fireplace tunes up the romance factor. Inviting and super comfy beds... Like us, we think you'll love this place! Summer rates are negotiable based on how long you stay. $250/night is offseason rate. Summer $250/nite except holidays or popular Summer Festivals are $330/nite + tax May 26 - Oct 15 RE CANCELLATION: We will refund your payments if we can re-book your time period, providing we have at least 30 days notice.